For most of its history, no one in the United States connected Halloween to “paganism” or “wicca.” Only within the past few decades has it gone from a harmless “kid’s holiday” to an urban legend taking root among both New Agers and fundamentalist Christians about Halloween’s supposed “pagan” past. Thanks to continued repetition of this urban legend by venues such as the History Channel and various New Age and “paranormal” publications, as well as fundamentalist Christian anti-Halloween “crusades,” most people today accept it as fact, never bothering to investigate it further. Today’s urban legend claims Halloween directly dates back to a pre-Christian Celtic Druid festival which the (evil) Catholic Church co-opted in order to “suppress” pagans. As with most urban legends, this one contains a dash of truth in order to hold together a bunch of complete nonsense. The customs we now accept as associated with Halloween are actually of much more recent origin than New Age urban legend suggests and are a mix of traditions and practices from throughout Europe, Britain, and Ireland. As with most things which began across the Atlantic and reached American shores, these various customs and traditions were blended, “Americanized” and repackaged into what we now call Halloween. What we do know for certain is that the modern Halloween celebration has no direct religious connection with the ancient Druids of Celtic Britain and Ireland. It’s true the Druids celebrated a minor festival at the end of October, as they did at the end of every month, but they had long since ceased to exist as an organized people when Halloween developed. At the beginning of what eventually became the New Age movement, Druidism saw a “revival” in the 1700s and 1800s, but just like the current New Age movement, this involved people with no real connection to ancient Druids – except in their minds – and no real connection to actual ancient Druid practices. Just like today’s New Age “pagans” and “wiccans,” a bunch of people pretended to be “Druids” with little actual historical knowledge (other than what they invented for themselves) of actual ancient pagan groups and practices. Let’s examine the ancient Druids a bit closer. First, unlike the image today’s self-styled “pagans” like to project, the Druids were not peace-loving “greenies” who liked to get naked and commune with nature. Instead, they were a rather violent and blood thirsty Celtic people who inhabited pre-Roman Britain and Ireland. The ancient Druids had much more in common with brutal peoples like the Aztecs than Kumbaya-singing hippies. Our earliest records of the Druids come from the Romans. It’s significant to note that even the Romans found these people excessively brutal. We also find that it was the Romans who suppressed Druidism. Tiberius (Roman emperor from AD 14 to 37) first outlawed the practice of Druidism. Under Claudius (emperor from AD 41 to 54), the Druids were completely wiped out in Roman Britain. The Roman record brings out two extremely important points regarding Druidism. First, very clearly, the suppression of the Druids had nothing to do with the Catholic Church, which had not spread much outside Judea at this point in history. So claims that the Church co-opted a Druid festival to create Halloween and force the conversion of Druids are flat-out false. Second, a hallmark of the Roman Empire was allowing conquered territories a large amount of relative autonomy as long as they continued to acknowledge Rome and pay tribute – this included allowing people to maintain local religious customs (we see this very clearly in Judea). The fact the Romans felt compelled to stamp out Druidism shows the Druids were anything but peace-loving nature freaks. So how does the Catholic Church get drawn into all this? In the fourth century, the Church instituted a feast day to honor all Christian martyrs of the faith. This feast day was originally celebrated on May 13. In 615, Pope Boniface IV established it as the “Feast of All Martyrs” and commemorated it with the dedication of a basilica in Rome to the Blessed Virgin Mary and all martyrs. By 741, the feast had grown to include remembering not only all martyrs, but all the saints in heaven as well. As a result, the name was changed to the “Feast of All Saints” in 840. In 844, long after the passing of the Druids and long after Christianity had become the predominate western religion, Pope Gregory IV transferred the feast to November 1st. October 31st itself held no special significance in the Church calendar until 1484 (again, long, long past the time of the Druids) when Pope Sixtus IV declared the “Feast of All Saints” a holy day of obligation (days on which Catholics are obligated to attend Mass – in addition to Sundays) and gave it a vigil and an eight-day period or octave to celebrate the feast (the octave of All Saints was removed from the Church calendar in 1955). For Catholics, the vigil is celebrated on the evening before the feast – hence Christmas Eve. Saints were known as “hallowed” in old English. Therefore, the vigil for the Feast of All Saints, or “All Hallows,” became known as “All Hallows’ Eve” – Halloween. The fact that “Halloween” is derived from old English and the Druids happened to inhabit ancient Britain is as close as we come to a direct connection between the Catholic Church, Druids and today’s Halloween. Even though it’s true that traditions such as dressing in costumes, Trick-or-Treating, and Jack-o-lanterns were originally inspired by ancient religious practices to ward off evil spirits, by the time these practices made their way to America, they had long since lost their religious meaning. Instead, they’d become much more along the lines of cultural traditions. Most telling is the fact that there is no mention of Halloween being a “pagan,” “wiccan,” or “evil” celebration in the past historical record. Only in recent decades has this notion taken hold. Once we consider the true facts, it leads me to ask just who exactly is it that has actually co-opted Halloween for their own purposes? While an argument can be made regarding Halloween’s gross over-commercialization, an argument that can now be made about several holidays, this fact is a reflection of our out-of-control consumer society and not a reflection on the traditional observance of Halloween itself. Similarly, the fact that Halloween observances have taken on increasingly gory and over-sexed aspects are because we as a society have allowed it. In a secular relativistic society which teaches that every opinion (as long as it has nothing to do with traditional family values) is of equal merit, should we really be surprised at this? However, this should not prevent us from reclaiming the largely innocent and clean fun aspects of the traditional American customs associated with Halloween. So, for good Catholics, there’s nothing wrong with enjoying All Hallow’s Eve. You don’t need to limit yourself to “Fall Celebrations” (which are actually much more pagan in nature than the traditional American observance of Halloween) or “All Saints Parties.” It’s okay for you to recapture the traditional American observance of Halloween. You can carve your Jack-o-lantern, throw on your costume, and go Trick-or-Treating all without fear that you’re participating in an “evil,” “pagan,” or “wiccan” celebration. Happy Halloween! For more information, here is an article from Fr. Robert Barron’s The Word on Fire Blog answering many questions about Halloween and Catholicism: http://www.wordonfire.org/WoF-Blog/WoF-Blog/October-2012/Culture–Time-for-Catholics-to-Embrace-Halloween.aspx. 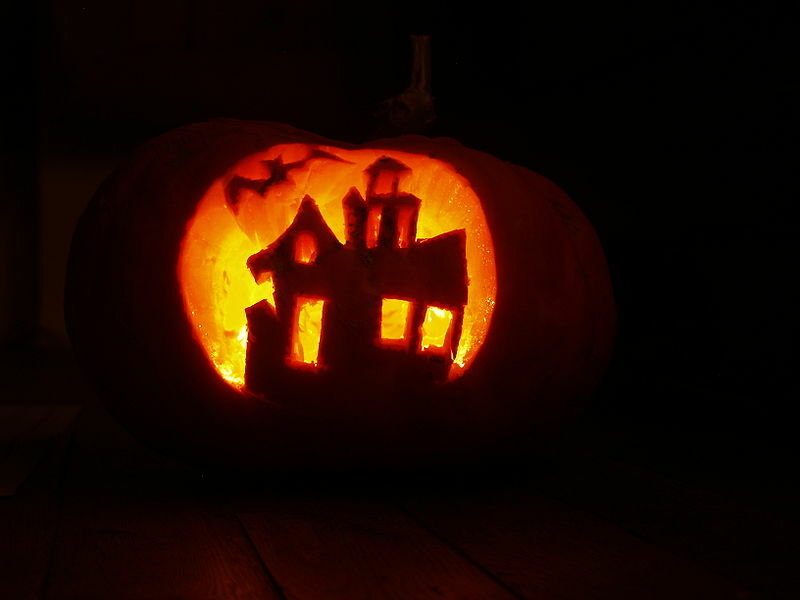 For even more information on the real history of Halloween, you may read this article by Fr. Augustine Thompson, O.P. : http://www.beliefnet.com/Faiths/Catholic/2000/10/Surprise-Halloweens-Not-A-Pagan-Festivalafter-All.aspx?p=1. As a further update, here’s a recent article from Catholic Answers with the same information as found in this article: http://www.catholic.com/blog/jon-sorensen/halloween-or-samhain. Here’s an article in which Dr. Taylor Marshall shares his “Top 10 Christian Halloween Ideas:” http://taylormarshall.com/2013/10/top-10-christian-halloween-ideas.html.